Saudi Arabia is the most important oil producing nation in history. The secretive Saudi government repeatedly assures the world that its oil fields are healthy beyond reproach, and that they can maintain and even increase output at will to meet skyrocketing global demand. But what if they can't? Twilight in the Desert looks behind the curtain to reveal a Saudi oil and production industry that could soon approach a serious, irreversible decline. In this exhaustively researched book, veteran oil industry analyst Matthew Simmons draws on his own three-plus decades of insider experience and more than 200 independently produced reports about Saudi petroleum resources and production operations. What he uncovers is a story about Saudi Arabia's troubled oil industry, not to mention its political and societal instability, which differs sharply from the globally accepted Saudi version. 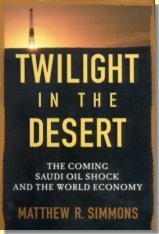 While Saudi officials promise to increase production from current levels if necessary, Twilight in the Desert examines the history of other major oil fields to determine that Saudi Arabia is in fact overproducing its primary resources, and couldn't possibly ramp up production for long. It calls for long-overdue transparency on the part of the Saudis and all significant global oil producers, along with urgently needed energy data reform, and a global energy blueprint for how the world will cope once Saudi oil output has peaked. Without question, Saudi Arabian oil fields provide the rest of the world with its most plentiful, low-cost oil resource. The question is how long can they continue to keep these critical pipelines open. Twilight in the Desert answers that question with keen examination instead of unsubstantiated posturing, and takes its place as one of the most important books of this still-young century.